Who would have thought that acquiring appliances, whether free or paid, can end up being a total headache. 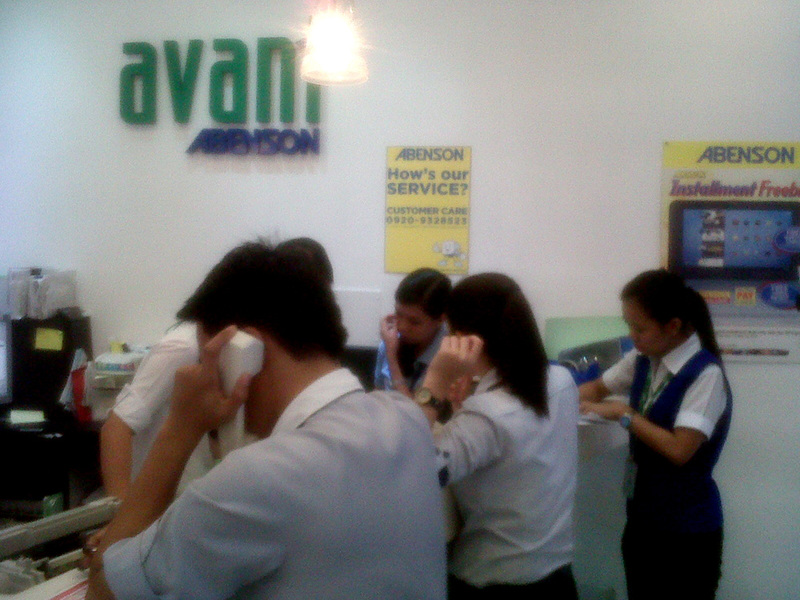 And our unfortunate experiences were not even limited to a single appliance store. Following an email sent to us by the organizers, Mon and I went with a couple of officemates to Abenson’s Avant to claim our prizes. We took our dinner break as the perfect time to claim them, as we thought that it won’t take that long just to retrieve already-reserved items. We were absolutely mistaken. We got there just fine, but we were made to wait for almost two hours. My rice cooker was nowhere in sight, as well as Mon’s oven toaster. The staff who attended us gave Mon his digital camera. It was not the exact model indicated by the organizers, and the lady took the liberty of choosing a supposedly better than the intended model, with the same price. (We just found out when we got back in the office that she gave a lower model and it was actually cheaper as well. Tsk tsk.) There were also missing sandwich makers and blenders. LOL We knew that we did not even pay for them, but it was just unimaginable that an appliance store located in one of the prime locations in Metro Manila, would be so lacking in quality service. Those of us who got their prizes on the spot, still had to wait for thirty minutes, and had to sign receipts after another (e.g. Jenny signed five receipts, even if she were only claiming two items). For the unfortunate ones, we were promised that they will deliver our items in the office, just to compensate with the bad service. It did not stop there, though. When Mama visited us last Tuesday in Makati, she went with us to Anson’s – Makati (the one across from Landmark) to buy our personal refrigerator. 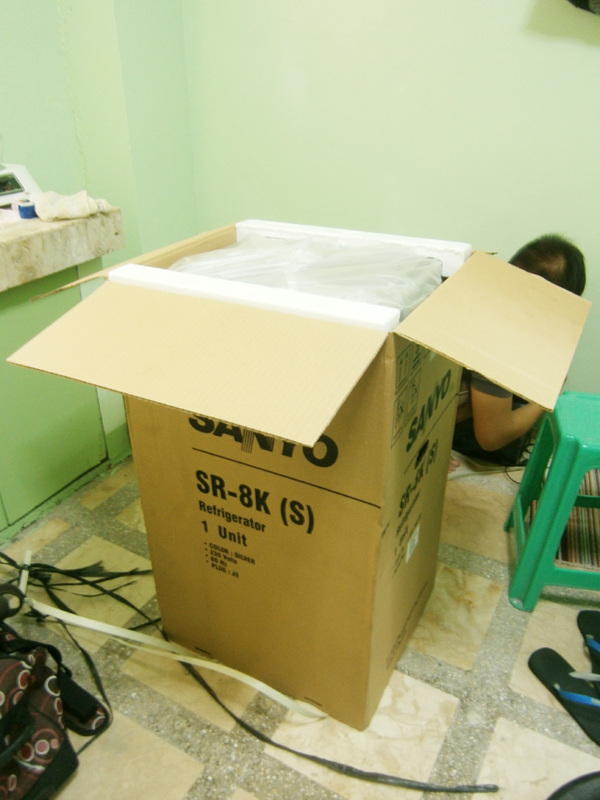 We just needed a small one because of our limited space, and we had our eyes on a Sanyo model because I have measured its designated space, and it would fit inside, with only about an inch on both sides. We did not test the refrigerator in the store, but we immediately did so once we got back in the apartment. We followed the directions in the manual for the first usage instructions and it worked properly, with the freezer having a thin layer of frost within the twenty minutes. But as we had to go home in our respective houses the same night after work, there was no use keeping the refrigerator on as it does not have anything inside. Fast forward to going home after Wednesday’s shift, I was excited to plug the refrigerator again, hoping to drink a cold glass of water for a change, because we have been drinking not-so-cold ones for a couple of days already. I even put water in the ice cube maker, hoping to try its freezing power. So imagine my shock when Mon woke me up the following morning and informed me that the freezer did not freeze at all. In fact, there was not even the slightest trace of coldness inside. I still haven’t taken my first cup of coffee but the alarming news was a jolt better than that. I left the manual in the office, so I just called Anson’s customer service from what I searched online. Nothing happened with that call, so I just went back to their store and personally complain about a defective unit. What puzzled me was that I was informed that their procedure for cases like this would be to wait for their home service team to personally inspect and ‘repair’ the item in our apartment, and after looking at it, replace it with a new unit. I did not bother contesting this development, but I was not too happy with the schedule being on Monday as I will be starting my new job that day.